Honestly, I don't think I will ever read a Stephen King novel I will dislike. King is my alpha and my omega. I grew up reading his book and have read 97% of everything he has published to date. I can even quote passages from his books from memory, so yeah, my opinion might be slightly biased, but man, this guy f**cking rocks. As with many King's stories, nothing is obvious or spelled out and you really have no choice but to keep turning the pages to get to the bottom of it all. The storyline spans a decade and its complexity is quite impressive - so many little plot threads intertwining with one another in the utmost brilliant and wickedly clever way. You see it all come together before your eyes and you're rendered speechless. It's epic. Madly and truly epic. King's approach to storytelling is predictably sadistic - no surprise there, right? As usual, he takes time introducing both the good and the bad guys, blurring the lines between what's right and wrong, making you care about them, sympathize with them, feel sorry for their fates or tragically bad choices. You can never predict the deaths - they come unexpected and they're brutal. Described with picture-clarity, they really get to you. And you almost feel like you've witnessed them yourself. Or worse, you have known the victims personally. The plot line is heavy and sticky, very molasses-like in its consistency. It's a disquieting, deeply unsettling kind of read, and I don't recommend it to people mentally fragile and scared of death. Death is, ultimately, what Revival is all about. This book is gritty and darkly fatalistic, immersed in existential dread and themes of religion, death and destiny. Dark powers, alchemy, occult rituals disguised as science and miracles, madness and damnation - these are just some of the things you'll find here. The way King talks about certain things - addiction, loss, mortality, pain - is almost too realistic for comfort. He draws from his own experience (the accident, shattered hip, alcoholism), and he doesn't hold back. You get the whole picture and it's a nasty, dark, horrifying and disturbing picture. It makes you very uncomfortable, mainly because these are things that could happen to any one of us. You don't want to think about it, you want to look away and pretend this has nothing to do with you, but you can't. You just can't. 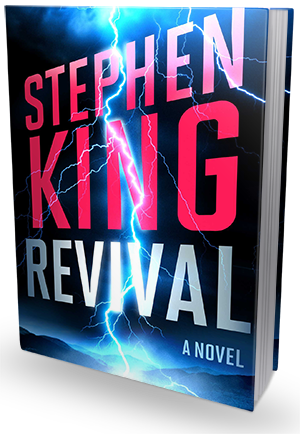 I found Revival to be utterly fascinating and illuminating. In parts controversial (particularly the parts dealing with faith and God), this story raises more questions than it answers and does not end on a hopeful note, but it's certainly a finely crafted piece of intelligent, affecting and mentally stimulating literature and I am so glad I got a chance to read it. Bravo, Mr. King. You did it again.